The cops. The cars. The clothes. Here's the first season of the explosive, groundbreaking detective show that redefined the world "cool." 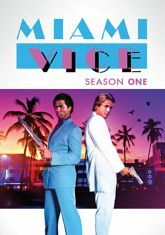 Set against the seamy and steamy Miami underworld, this series allows you to ride shotgun with suave cops Sonny Crockett (Golden Globe� winner Don Johnson) and Rico Tubbs (Phillip Michael Thomas) as they battle a never-ending gallery of criminals. Jan Hammer's electrifying score features a soundtrack of rock legends, including Glenn Frey, Phil Collins, U2, and Peter Gabriel, and every episode crackles with excitement and stylish flair. Also stars Emmy� and Golden Globe� winner Edward James Olmos and a powerhouse roster of guest stars, including Ving Rhames, Jimmy Smits, and Bruce Willis.